Authored by: Nancy Beck Young, Ph.D.
No subject in American history has wider universal appeal than the presidency. Invented at the Constitutional Convention in 1787, the institution of the presidency has evolved into the most powerful elected position the world has ever known. For many students and general readers, the presidency—and individual presidents—are the entryway into studying our nation's past, providing a face and personality for understanding an era and grasping the essential issues, themes, and events of American history. The landmark reference to this important topic, the six-volume Encyclopedia of the U.S. Presidency devotes one comprehensive chapter to each of the 44 U.S. presidents and his administration. Each presidential chapter—featuring a biography, an article on the presidential campaign, and an article on the president's administration—provides students and readers with all the information they need to understand the president and his era. Also included in each chapter are articles on every major event, law, incident, and action that took place during the president's term in office. In addition, every chapter contains biographical essays on the first lady and vice president, as well as a social history essay on a key development of the era. 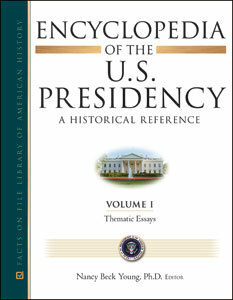 Useful reference features in each chapter include a presidential fact box; an election map with complete vote tallies by state; tables listing the president's cabinet, Supreme Court appointments, and congressional leaders; chronologies of the president's life and administration; a generous assortment of original documents; and an extensive bibliography. In addition, one volume of the encyclopedia features thematic articles on vital topics of the presidency. These include the origins of the presidency, evolution of presidential power, presidential election process, presidency and political parties, presidency and Congress, presidency and the judiciary, presidency and the military, presidency and the press, presidency and popular culture, "imperial presidency," and presidential powers compared with executive authority abroad. Encyclopedia of the U.S. Presidency is the most comprehensive and detailed reference on the presidency ever published. Fully illustrated and covering more than 200 years of American history, this groundbreaking new resource offers a wealth of information for students, scholars, and the general public. Nancy Beck Young, Ph.D., is associate professor of history at the University of Houston. An award-winning biographer and expert in American government and the presidency, she has written and edited several books, including Lou Henry Hoover: Activist First Lady; Franklin D. Roosevelt and the Shaping of American Political Culture; Texas, Her Texas: The Life and Times of Frances Goff; and Wright Patman: Populism, Liberalism, and the American Dream, which won the D.B. Hardeman Prize for the best book on Congress. "...this work is well researched, well written, and easily understood...Highly recommended." "This definitive scholarly resource is for serious students and teachers. These six volumes allow students to gain insight into...the presidency. Highly Recommended."